JAY-Z is a concept that comes at Shawn Carter’s expense. His ego caused him to shoot his brother over a stolen ring, stab a record executive over a bootlegged record, and nearly destroy his marriage despite being married to literally Beyoncé. This justified hardness didn’t spring up out of callousness, though, and throughout his career he’s peeled layer after layer away from his hard knock life to show how it started. In one of the ornate TIDAL teasers for 4:44, his new album, we saw a boy running away, his face twisted with fear while wearing a t-shirt printed with the words “STAY BLACK.” JAY-Z was physically absent from the promo, but his connection to that youth wasn’t. Now, 47 years old and one-half of a billion dollar couple, he’s privileged enough to separate himself from that black anxiety while admitting its presence in its life. Rap is a proudly competitive genre, and America is a country that targets black men. The coolness of hip-hop’s tropes—materialism, and the hardened poise—aren’t just accessories, but requirements for survival. How that armor masks un-sutured pain has been a key theme in JAY-Z’s discography, but not a dominant one. On 4:44, it’s the guiding principle. 4:44’s existence is invariably tied to Lemonade, Beyoncé’s raw meditation on black love that brought JAY-Z’s alleged infidelity to the forefront. 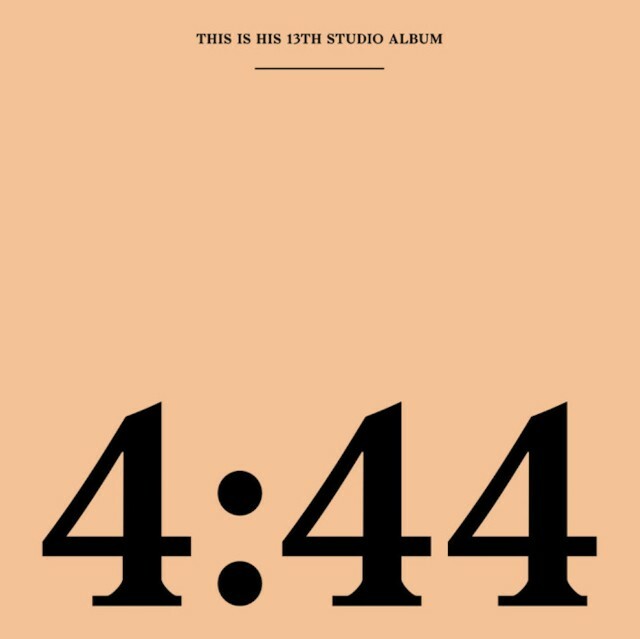 A far more thoughtful album than the glossy and disconnected Magna Carta Holy Grail, it’s a 36-minute confessional that attempts to bring JAY-Z’s narrative full circle. Now far removed from his hustler days, he’s wiser about the way wealth actually operates in America. The man who crudely boasted about the difference between a 4.0 and a 4.6 spends a few bars on “The Story of O.J.” lamenting how he could’ve spent some money on a soon-to-be profitable DUMBO real estate investment instead of all those V12 engines, back when he was young. He once proclaimed he’d “carry on like I’m non-religious” on The Dynasty: Roc La Familia’s fatalistic “Intro,” but by 4:44’s ending track, where he remembers a familial history of sexual abuse at the hands of the church, he’s coming closer to God. The Notorious B.I.G., a constant source of material in Hov canon, is again alluded to as bars from ”Unbelieveable” reappear in the penultimate “Marcy Me,” a detailed tour from his origins in the Marcy projects to his come-up as a dealmaker. Sentimental reflection aside, it boasts some of the album’s coldest lines: “Hold a Uzi vertical, let the thing smoke / Y’all flirtin’ with death, I be winkin’ through the scope.” The wizened perspective and sharpened lyrics bring repeated a-ha moments as these connections to his older self continually reveal themselves. 4:44 also holds the distinction of being the first JAY-Z album to use just one producer. No I.D., who was on the boards for Jigga’s post-retirement hits like “Run This Town” and “Holy Grail,” likened the process to a “therapy session.” Through soul chops and swings, No I.D. wordlessly converses with JAY-Z’s personal performance, giving the project a naturalistic hum. “Kill Jay Z” swells and recedes—the Alan Parsons Project’s sample crashes as Hov turns his attention to estranged brother Kanye West (“If everybody’s crazy, you’re the one that’s insane”), positing himself as the anguished protagonist. “Family Feud,” his call for cross-generational unity, gets its added levity from the way Beyoncé’s voice accents the Clark Sisters’ sampled joy. Occasionally, JAY-Z’s referential style lands awkwardly. “Moonlight” is too reliant on the La La Land reference to stick, and the reference to Al Sharpton’s selfie on “Family Feud” is as distractingly up-to-date as last year’s “Damn, Daniel” nod. Still, his missives and admissions are bolstered by his impressionistic swerves. His black capitalism manifesto “The Story of O.J.” isn’t necessarily packed with new ideas—the conspiracy theory of Jews owning all the property reappears as a sour note—but the off-beat asides and use of space gives JAY-Z’s thoughts some definition. The sarcastic pause that interrupts “I’m not black, I’m OJ….OK” lands as crisp as bodega chicken tenders. Placed at near opposite ends of the sequence, the Damian Marley-starring “Bam” and “Smile” point to two different possibilities for JAY-Z. “Bam,” which adroitly flips the Sister Nancy song—another dig at Kanye, who did it on last year’s “Famous”—has the painterly thrill of a man who once dedicated entire verses to how he’ll dispatch you (“Put that drum in your ear, don’t get Sremmed / I’ll Bobby Shmurda anybody you heard of”). It hints that JAY-Z could still mine his old Roc-A-Fella habits for another career’s worth of verbal pyrotechnics. However, 4:44 most resonates with “Smile,” where JAY-Z’s mother Gloria Carter comes out as a gay woman. The revelation is touching when it arrives early in the song (“Cried tears of joy when you fell in love / Don’t matter to me if it’s a him or her”), but in the third verse he rifles through the industry’s predatory treatment of black art, the racially biased incarceration rates, and the drug trade’s traumatic effect on African-Americans. The more that stands in your way, he suggests, the more revolutionary your liberation. When Gloria arrives with a poem to close the track, free despite the systems opposed to her, she sounds resolute. This is the beating heart of 4:44: honesty not as an exposed wound, but a well of strength, and a way to see the arc of your life in full.